T-Mobile wants to obliterate any notion that its coverage is inferior to the competition. The cellphone carrier announced Monday that all T-Mobile customers with a "Simple Choice" plan can now receive a free mini cell tower for their home. The 8.5-inch square gadget blasts out T-Mobile's 4G-LTE network to a 3,000-square-foot radius. T-Mobile has done this kind of thing before. It previously gave out free Wi-Fi routers that allowed customers to make calls and texts over their home Wi-Fi networks. What T-Mobile announced Monday is different: The mini tower (T-Mobile is calling it a CellSpot), lets customers connect to T-Mobile's cellular network -- not Wi-Fi. That means in places where they received one or no "bars" of service, they'll now get a full, speedy connection. Other carriers have similar offerings, but they cost hundreds of dollars. T-Mobile is giving them away for free (OK, for a $25 refundable deposit). "The big difference between us and the carriers is that they'll do absolutely everything they can to bleed you dry," said John Legere, T-Mobile's CEO, in a statement. "We'll do absolutely everything we can and use every proven technology available to give you the best coverage possible." T-Mobile (TMUS) says that 50% of cellphone customers -- of any network -- complain that they drop calls at home. Basements, garages and pre-war apartment buildings all suffer from lousy cell signals. So there's an obvious need to address the indoor coverage gap. The CellSpot, manufactured by Alcatel-Lucent, hooks up to your home router. Using your Internet connection as backhaul, it broadcasts T-Mobile's 3G, 4G and 4G-voice networks to up to 16 connected devices. That's a first -- some other carriers offer just 3G, and most connect just four phones. 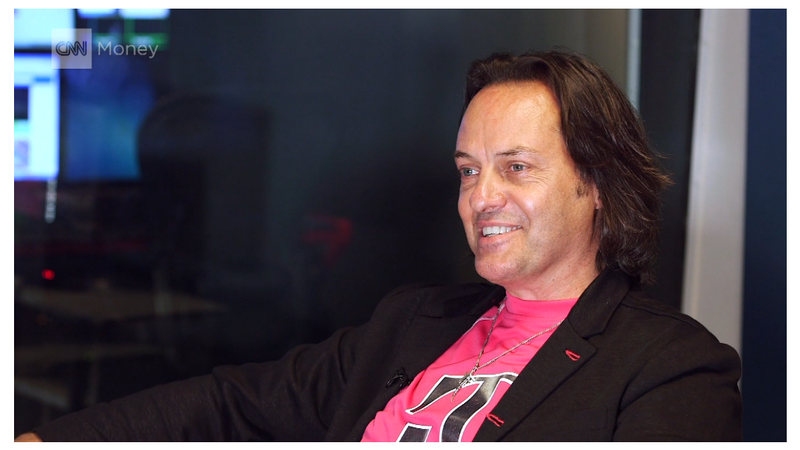 Legere called the CellSpot "a huge feat of engineering." The company said that it has handed out a million of its old Wi-Fi CellSpots, which it considers to be very strong adoption (it has more than 50 million customers). Giving the CellSpots out for free instead of charging a couple hundred bucks is a way for the company to keep customers and add new ones. By addressing a common issue and presenting a solution for free, T-Mobile said it's hoping to turn a few heads and get people to consider switching. Add this to the long list of other "Uncarrier" benefits that T-Mobile offers, including free international roaming, music that doesn't count against your data plan, free texting from airplanes, and no overage charges.